This is another lesson I taught prior to Diane deGroat's visit. (See Dogs Don't here.) 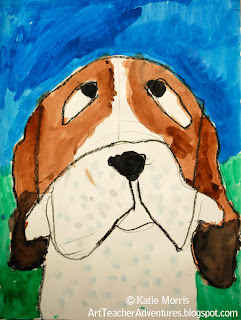 My goals for this lesson, besides building excitement for the author/illustrator visit, were to draw attention to careers in Art, teach about perseverance, and introduce wet on wet watercolor technique. 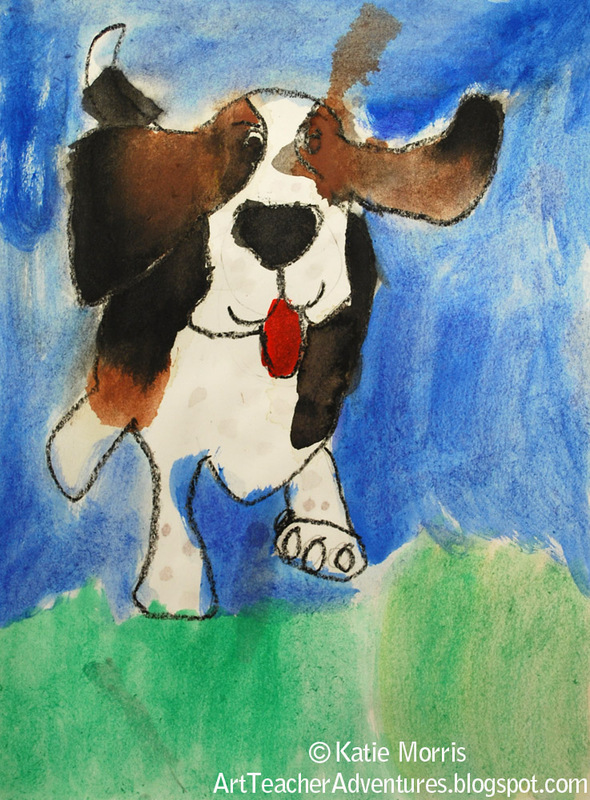 I started by playing Barnes and Noble's video of Charlie the Ranch Dog (scroll through the older books at the bottom to get to Charlie) so the students could see the artwork projected REALLY BIG. I think the students were already familiar with the story but I asked them to pay special attention to the role of the illustrations- how the artwork helps tell the story. After the story, I showed them parts of a blog post by Ree Drummond/the Pioneer Woman about the process of writing and publishing Charlie. 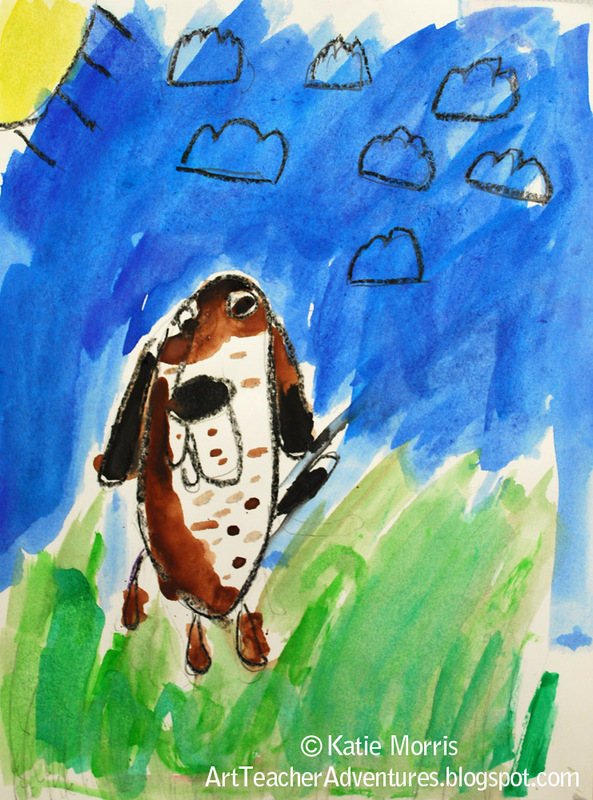 The post had good information about the collaborative process and how the publisher, author, and illustrator all worked together until the book was perfect. This is where the perseverance part comes in- the post touched on how Diane deGroat made lots of preparatory sketches and plans and had to revise her work. I think this is good for students to hear about when they can be quick to complain about the simplest revisions. In addition to text, the post was a wonderful resource to find lots of photos of the illustrative process. In particular, I liked this photo showing sketches of Charlie in different poses. 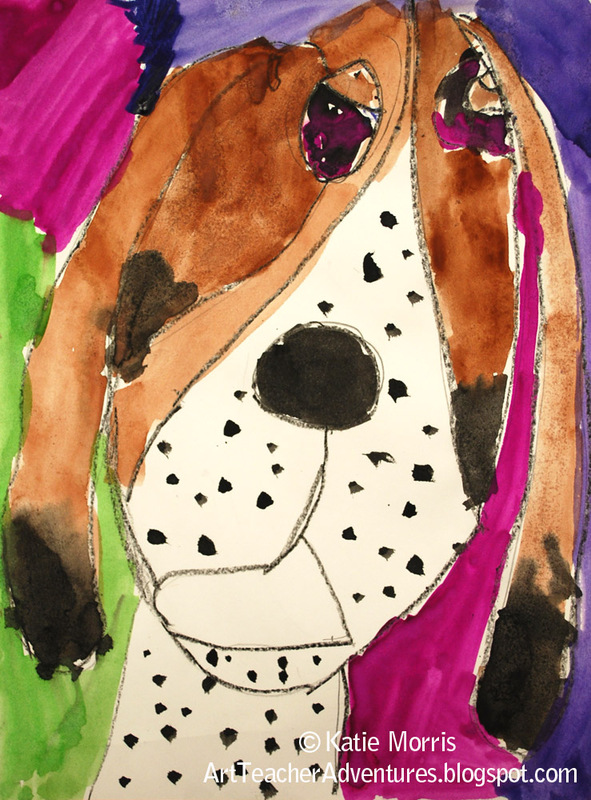 We talked about how deGroat referenced photos of Charlie as she created her artwork since the book is based on a real dog. The students' job was to pretend they were illustrators and reference photos of Charlie and deGroat's sketches to make their drawings. I tried to get the students to draw big and fill the space- this continues to be one of my biggest challenges. 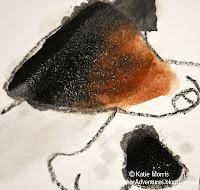 In the second class period, the students traced their pencil drawings with black crayon before I demonstrated the wet on wet watercolor technique I wanted the students to try out. I showed how to load the brush with really wet brown paint, apply it, then load with black and let it run together and blend. Some students had a hard time getting the right consistency for the paint but most eventually figured out how to work fast enough to let the colors blend. 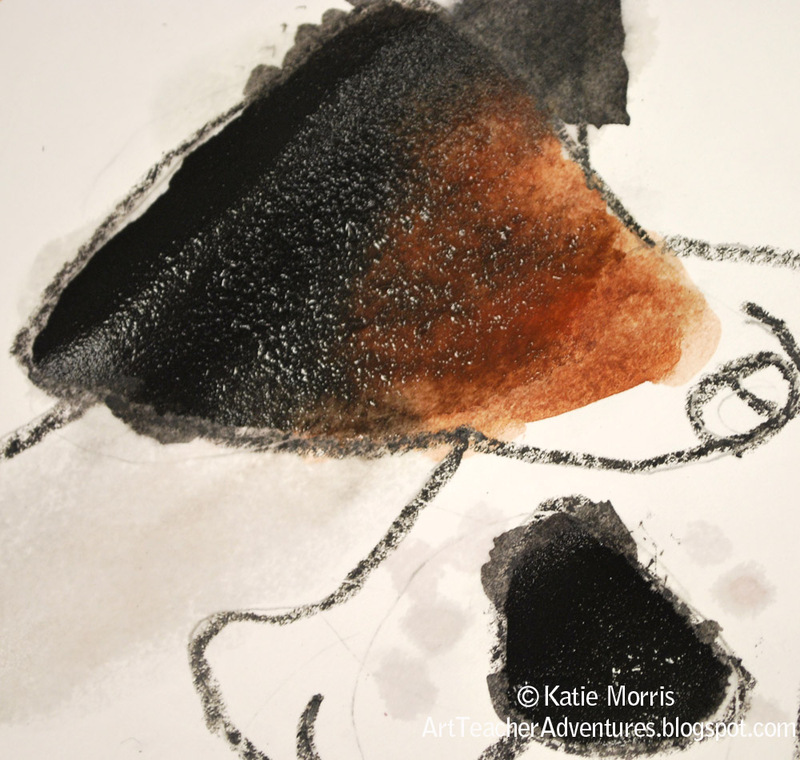 At first, I just wanted the students to trace with black crayon to make their drawings bolder, but it ended up working as a barrier and mostly keeping the wet paint inside the lines. The biggest surprise for me with this lesson, was the level of stress it created for students. 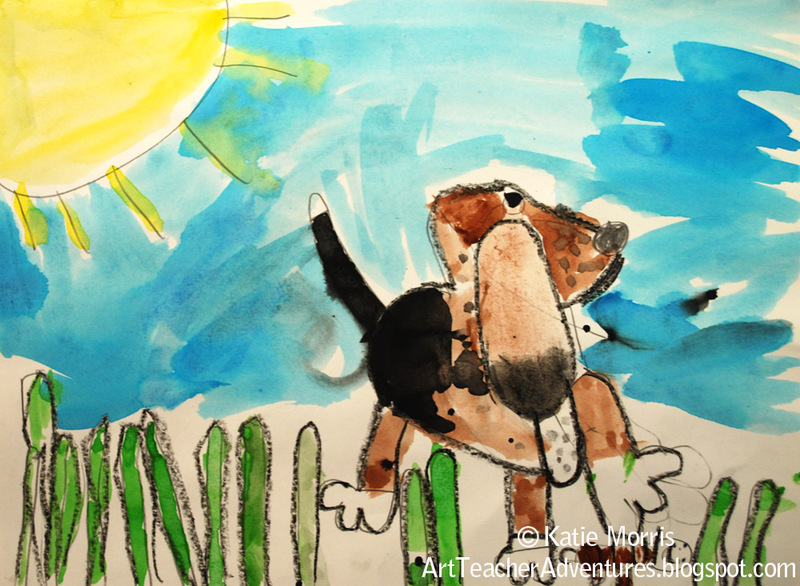 They love dogs, they love the story, they love painting. BUT, a good chunk of students, sort of freaked out when drawing. I don't think I've ever had so many students try to get me to draw something for them before. It was my 2nd graders during this project that prompted me to create and hang a "No I Can't Allowed" sign on my door. I had to stop classes and so we could chant "We can do hard things!" It was slightly ridiculous. You'd think that I'm a perfection-demanding slave driver from some of their reactions. I thought maybe they were intimidated by looking at deGroat's illustrations but we even talked about how we weren't trying to copy her, just work like her, and how even my painting was not as good as hers because she's been working at illustrating books since well before the students or I were born! Some had to start from scratch in the 2nd class since they spent most of the 1st trying to convince themselves and me that they couldn't do it. The atmosphere was much more positive in the 2nd class period with the promise of fresh paint! I love the little guy with the flipped up ears! !